Cosmo is a happy, intelligent, and overall great family dog. 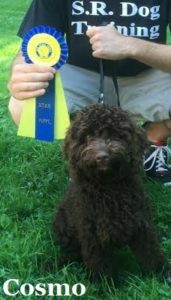 His owners contacted me for Labradoodle Training in Westchester NY. Cosmo’s family are very caring, dedicated, and competent dog owners. They understood the importance of early puppy training, so we began Cosmo’s Labradoodle training as soon as he arrived from the breeder in Seattle, WA the age of 8 weeks old. Cosmo’s owners have achieved amazing success with housebreaking, crate training, puppy biting, jumping and off-leash obedience training. 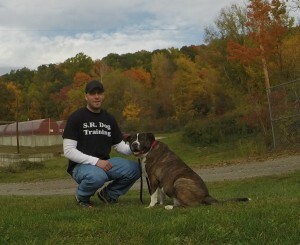 His family helped him to successfully graduate my AKC S.T.A.R. Puppy Program and become an overall well-mannered and very social dog. Cosmo’s family enjoys taking him to various public places, such as weekend farmer’s markets. Their dedication to our training, now enables them to take Cosmo virtually anywhere, without Cosmo jumping on people he meets, walking well on-leash, and listening to their obedience commands. The commands we covered are: Sit, Down, Come, Place, Drop It, and Loose Leash Walking. By using sound dog training principles, I can help you and your dog, regardless of their breed, age, or size. Cosmo has all the amazing qualities that you would hope for in a young dog. However this did not happen by accident. This happened because his family is loving and dedicated to raising and training a well-behaved dog.